Of all the Legiones Astartes, the White Scars of Jaghatai Khan remain the most enigmatic and elusive. Born of a civilisation that prizes honour, speed and fearsome loyalty, their allegiance has yet remained unclear even as the galaxy is torn apart by Horus' treachery, and both sides have apparently counted them among their potential allies in the war to come. But when the Alpha Legion launch an unexplained and simultaneous attack against the White Scars and Space Wolves, the Khan must decide once and for all whether he will stand with the Emperor or the Warmaster...or neither. Really enjoyed this book, About time we got some white scars in the lore. Really enjoyed getting a peak at their lifestyles and their tactics. Book kept me in the entire story. Excellent story, but brought down by too much "ethnic stereotype" voice acting. Good background for 40K fans. This installment has much more than you might expect and touches on many smaller threads in the epic. Of course it also goes a long way to illustrating the nature of the White Scars themselves. Skillful writing, fantastic narration. The author does a great job conveying just how tense and confusing it was at this point in the Heresy. The White Scars Legion has heard whispers of treachery and the time has come to decide who’s side they’re on. Tensions run high as they uncover frightening truths about the state of the Great Crusade. This book is a winner, I would recommend this to any Heresy fan. I cannot recommend the series for military Sci first fans more. Further the voice talent is so perfect it amazes me. looking forward to the next book. Outstanding, one of the best books in the Heresy! This one has everything, a must-listen. It is packed full of great scenes and epic moments. Great entry in the Horus Heresy series! 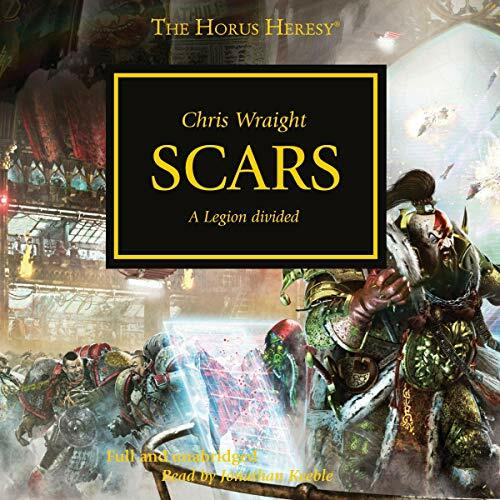 Scars is a fantastic entry in the Heresy series. The story was engaging and added to depth of the series. The performance by the reader was great. You will enjoy this book. Scars fans haven't had much love. But this fantastic book changes that. Immerse yourself in the Vth legion with this excellent performance!